The health-focused wearable will ship in 60 countries. Sony is aiming to make a bigger splash in the smartwatch and fitness tracker arena when it ships its Smartband 2 in September with an integrated heart rate monitor. The new model will be available in 60 countries at a €119 ($130) price tag. The heart rate monitor is an important addition for Sony if the company wants to keep up in this increasingly competitive market. The waterproof Smartband 2 lets users know they have a call, message, email or social notification using vibrations and blinking LED lights rather than a screen. Users can also control music playing on their smartphone or tablet, by tapping to play, pause or skip through tracks. The armband will vibrate to alert users when they are more than 10 meters from the connected smartphone, as well. 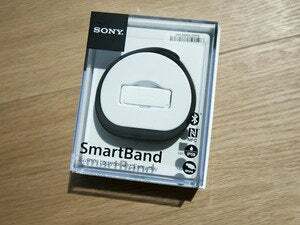 The SmartBand 2 reaches full battery capacity in approximately an hour, and once charged it should last up to 2 days, Sony said. It will be available in black and white at launch, with Sony adding pink and indigo shortly thereafter. Users can also swap in bands that fit earlier versions of the company's wearable. The SmartBand 2 is used alongside Sony's Lifelog app and is compatible with Android and iOS devices.